Precise determination of the pion-nucleon scattering lengths. The pionic deuterium level shift reveals isospin breaking effects by constraining the scattering lengths as obtained from pionic hydrogen. The pionic deuterium ground state width is dominated by true absorption and directly related to pion production strength α at threshold. To measure the strong interaction width Γ and shift ε of the ground state of pionic hydrogen with high precision better than 1% for the shift and about 2% for the width. Use the PSI cyclotron trap to produce pionic atoms in a controlled environment. Use crystal spectrometers and CCD detectors to measure precisely the X-ray energies and line shapes. Perform measurements for different transitions. 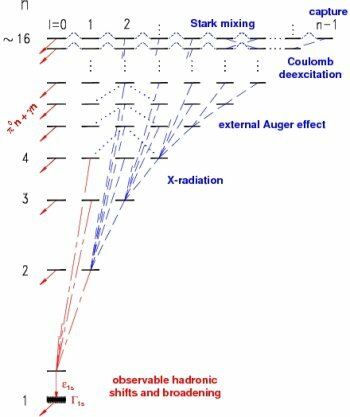 Perform measurements of muonic hydrogen to quantify the Doppler broadening of X-ray lines from Coulomb explosion. Correlate cascade theory to the Doppler broadening corrections. Precise determination of the charged pion mass.